There’s a back-story to this trip. My grandfather served on the USS Cobia during World War 2. 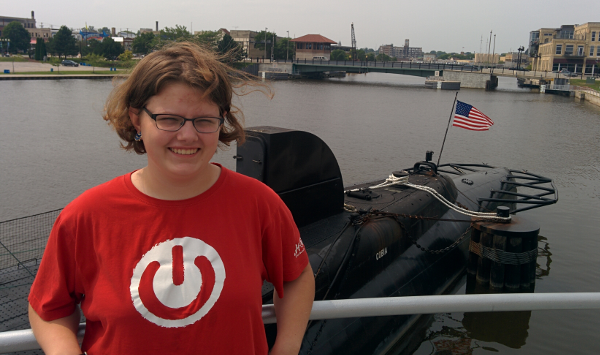 Through an accident of history, that very submarine is preserved as a floating museum in Manitowoc, Wisconsin. Grandpa died over a decade ago. I found out about the Cobia several years after he died. Grandpa never mentioned that it still existed, though he had attended crew reunions there. I think he considered his service to be very personal and never spoke of it much. I’ve wanted to visit, to make a pilgrimage if you will, but I wanted to take the girls when they were old enough to remember and appreciate the history of the thing. I took advantage of a confluence of events this year to do it: 1) Alpha is old enough, 2) an impending total eclipse would pass (relatively) close by, and 3) I wanted a vacation and a road trip. Alpha was agreeable to going, and she too wanted a road trip, so boom it was on. As a side note, Alpha handled this trip with aplomb. She has a bladder of iron, remained agreeable even when things went sideways, and is generally helpful around the car. Overall Trip Statistics: 5 days, 10 states, 2700 miles, 2900 feet at highest pass. We chose to leave on a Friday. I put in enough of a day at work to count it as a full day and avoid using another vacation day, which meant leaving around lunch time. Alpha and I were packed and ready to go by 1 pm. 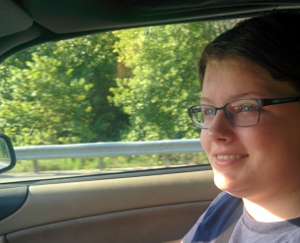 A final stop to see Meghan at work, and we hit the highway… and traffic. I made the mistake of assuming that traffic would be moderate at mid day. 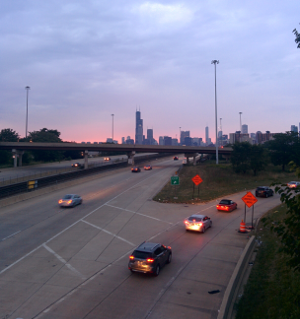 Friday afternoon rush hour tends to be nasty, especially so in summer, but it begins earlier than I know. As we crawled our way down the turnpike we witnessed an almost-crash in front of us. 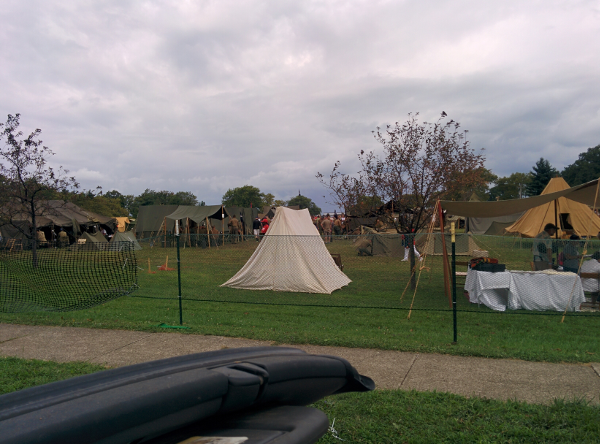 We mostly idled our way until Charleton. I guess that house rentals in Maine must run from Saturday to Friday, since a large portion of the cars around us were from NY, NJ, and PA and they all peeled off at the I-84 exit. The rain moved in as the traffic cleared. 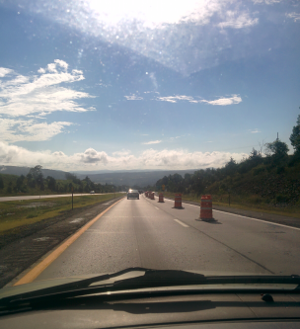 We made fair time for a couple of hours as we skipped into New York state under showers. Skies cleared by mid-state, with a few hours of sunlight left. After dark we cruised through the Seneca reservation. All of the road signs were translated into Seneca, which was kind of neat. They also have a casino that, much like Foxwoods, rises out of the forest in a jumble of incongruence. We made Erie at about 9:30 that night – a Motel 6 alongside Interstate 90. It was a plain, but clean and serviceable hotel. We turned in sans dinner and slept well. Central and western New York are very boring. We didn’t get cell phone service anywhere and the highway just seems to go forever. There are some peculiar town names in western New York, ‘Horseheads‘ was a particular favorite. Breakfast at the Zodiac Dinor (sic). It was delicious and huge; we never did care to eat lunch that day. 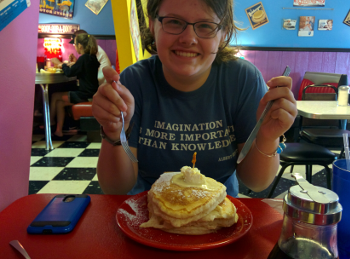 We had a fantastic breakfast at a local diner and set off on the scenic route for a little while. We wanted to see Lake Erie. Along the way we found some sites and some sights. The day was warm but a little cloudy, which meant that it never got too hot. 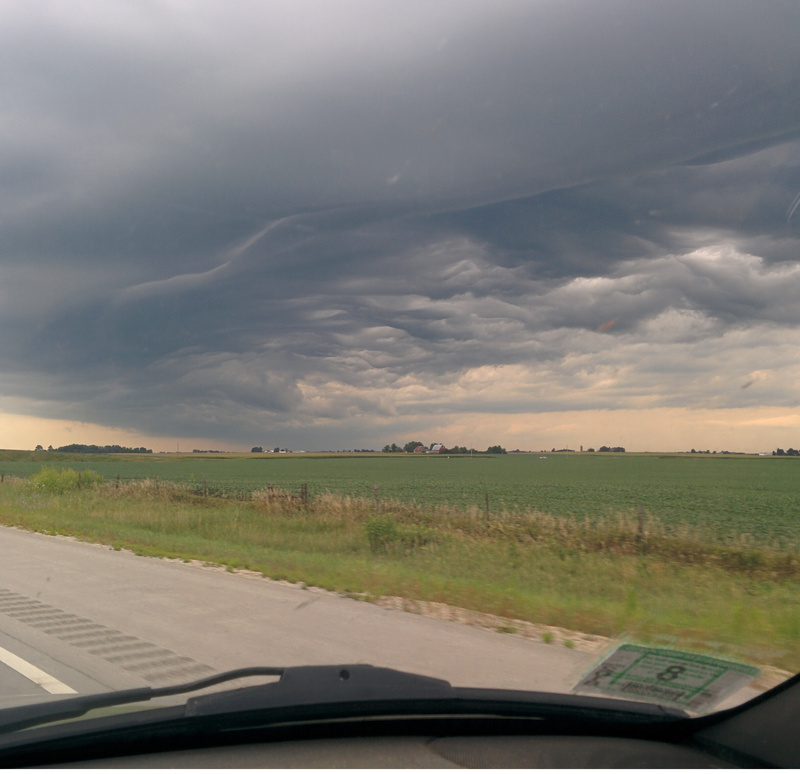 I was looking forward to rolling with the top down on this trip and I was not disappointed. 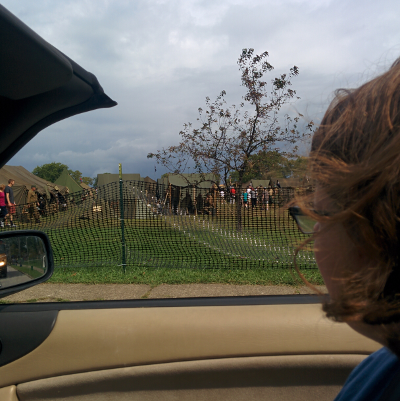 We hit the sweet spot for a convertible: 50 mph @ 72 F, moderate humidity. Before we left Conneaut, Ohio we stopped at a lemonade stand; the kids even served us in the car. (I’ve made it a policy over the years to always stop for lemonade.) The roads were beautiful, alternating between showing us the lake and just being green. The scenic byway made some very close passes to the coast and we saw some great views of the lake. Lake Erie itself is gorgeous. The towns that border the lake are a mix of quaint, middle-America, and gaudy: some reminded me of Cape Cod, some reminded me of the over-commercialized beach town of Misquamicut, RI, and some reminded me of any number of nondescript towns that I’ve encountered along my travels. 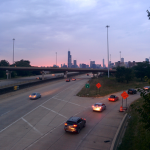 We switched over to the highway around Geneva-on-the-Lake, Ohio, as we became conscious of the time: I wanted to get into Chicago before sundown. Being Saturday we didn’t have to worry about rush hour. We rolled into town around 5:30, which was perfect. 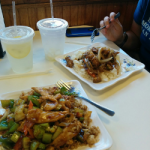 Our hotel in Chicago was right next to Chinatown, so we took a walk to find some dinner. 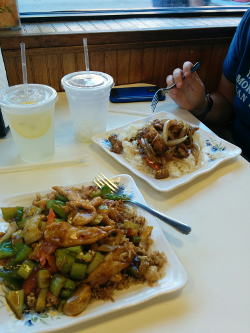 We found a hole-in-the-wall with some of the best Chinese food I’ve ever had. We turned in no long after dinner; we had a full day ahead. We spent a little time unwinding and calling home. Earlier in the day we had found out that the USS Indianapolis had been located, and shared the news with Meghan and Beta. They proceeded to watch Jaws (with the Indianapolis scene) and brag to us about doing so. 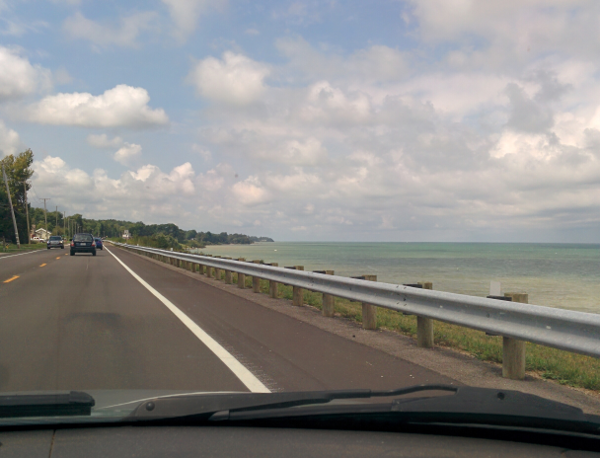 Route 531 along the coast of Ohio is beautiful. We stopped to rest for a bit in Indiana. The turnpike was single-lane (for construction) and bordered by jersey barriers on both sides for miles, which does weird things to your brain after a while. 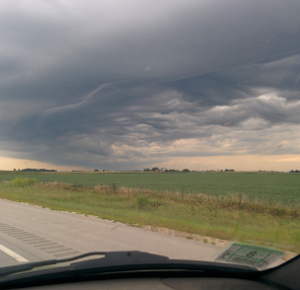 The Indiana turnpike is bumpy as hell, and boring, until you approach Elkhart. This was the main event. We arrived around lunchtime. 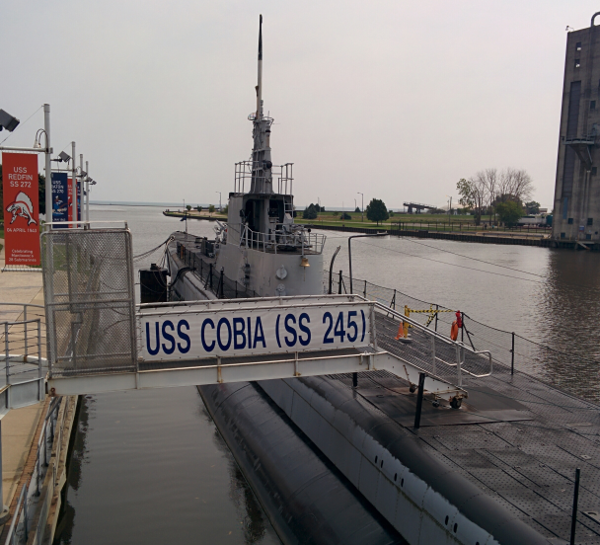 USS Cobia, positioned at the stern and looking towards the bow. 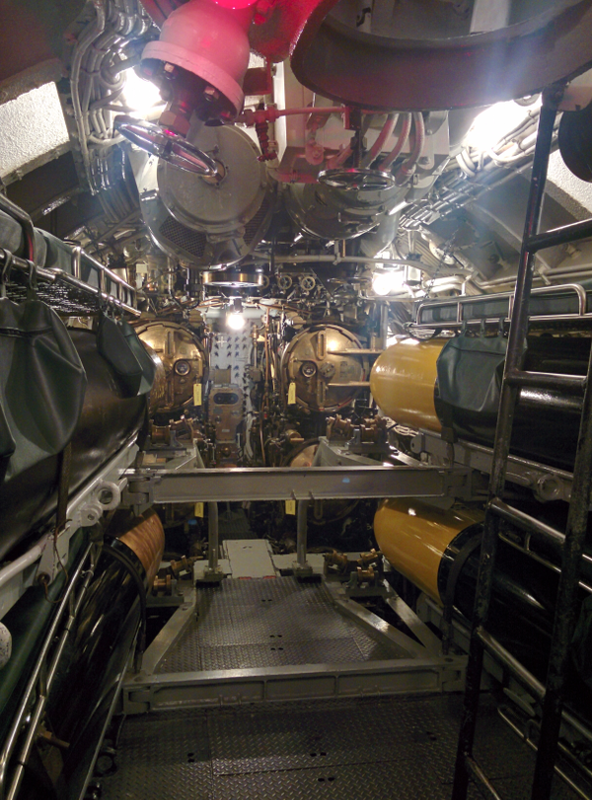 There are regular tours of the submarine, from forward torpedo room to aft torpedo room. They’ve restore the submarine to about 80% working condition. We found at least three, possibly four, photos with Grandpa in them. The questionable photo is from a reunion photo, not everyone was looking at the camera and, sad but true, old men all start to look alike after a certain age. One other photo that we saw him is from a reunion, the final two are from his time on the submarine. Our tour guide was new – his first day! – and he wasn’t familiar with any of the crew besides the captain. Grandpa, being an officer but not the captain, wasn’t a name he knew. The tour was about twenty minutes from bow to stern. Being a real WW2 submarine the quarters were very cramped; I’m not sure how my grandfather, being a few inches taller than I am, was able to fit through the tiny intra-compartment doorways. 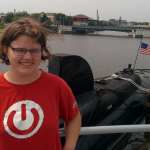 The submarine part of the museum is a little small; there’s a somewhat larger section devoted to boats on Lake Michigan and the various wrecks. Alpha and I agreed that we’d like to come back another time to view the lake history in more detail. We ate dinner in Chicago, a pizza place of course. After we got back to our room Alpha wanted to veg out. I felt cooped up by the car all day, so I went out for a walk around the neighborhood. 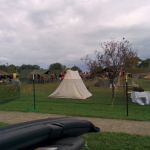 I took some photos but they were terrible; I need a new phone with a better camera. The state of Wisconsin replaced a large section of the pavement on Interstate 43, both northbound and southbound, with a concrete washboard. The car’s computer calculated our average MPG to be north of the 30 mark sometime this day. Alpha and I got going a bit later than I had originally planned, and had a smashing breakfast at a market that’s a block from the hotel. 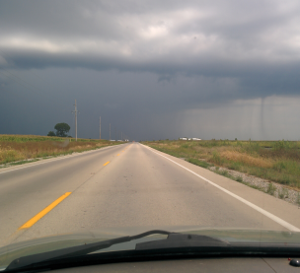 Getting close to or under the eclipse path was a bonus, so we didn’t have any specific destination to reach, just “as close as we are able or choose to get.” I picked Marion, Illinois as a target and we started driving. We hit some traffic along the way, not due specifically to the eclipse but around construction along the highway. I don’t know if traffic would have been lighter and we would have slipped right through if it hadn’t been for the eclipse. We probably spent an hour and a half sitting in various stand-stills, and 30 minutes more finding detours, and were about an hour outside of Marion when we decided to stop to watch the eclipse in Effingham. It was a fair place to stop, with fuel and food, and we weren’t the only ones peering up at the sun. While it wasn’t directly in the path of totality the sun was reduced to a tiny hair-like sliver. The clouds proved to be a mixed blessing by obscuring the view but allowing us to take unfiltered photos of the eclipse. I was too busy taking in the moment to photograph the actual peak — this was from about four minutes before the peak. 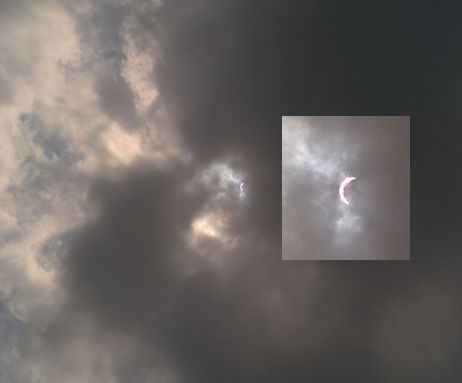 The eclipse was moving from left to right in this photo, and the top was the only bit visible at the peak. 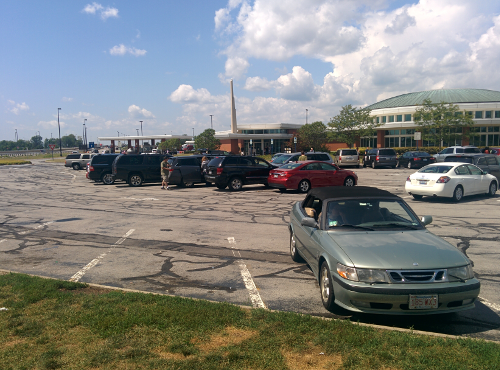 From the stopping point, our next destination was Lexington, Kentucky. 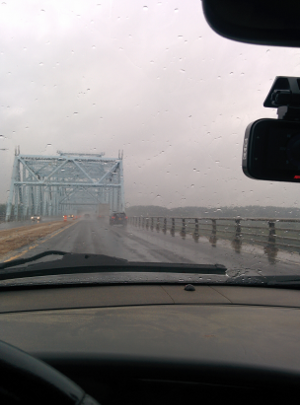 We got into Lexington late, due in part to rain. A large part of our drive was on country roads which, more than the interstates, are long, straight, and surrounded by corn. Alpha stayed in our room while I took a swim in the hotel pool. We were in bed and lights-out before 9 pm, as we were leaving very early the next morning. Midwestern seasons seem to be like New England: almost-winter, winter, still-wintery, and road construction. The side roads are much better for driving than the interstates, and almost as fast and direct. Indiana doesn’t seem to understand the concept of interstates. They have traffic lights and intersections on I-64. This was the longest, hardest drive of the trip: almost a thousand miles in one day. Under the best of conditions it would be a fourteen-hour trip. Alpha and I discussed doing it in one day or breaking it into two, and her answer was firm: lets go home today. So we did, come hell or high water. We didn’t take any scenic routes or make any unnecessary stops, it was just pounding the pavement (so to speak). We left Lexington at 7:30 am and made it home around 11:30 pm. We texted Meghan every time we crossed a state line, and she was reposting our updates to Facebook. Somewhere in eastern Kentucky we passed a field that could have been straight out of a Bob Ross painting, with a shed or small barn, happy little trees, and a small mountain in the background. West Virginia is beautiful, even from the highway, though cell phone reception is non-existent. We suddenly had great coverage when we entered Maryland, even though the mountains didn’t stop, so it seems to be a political issue not a geographic one. We reached a peak mileage of 31.8 MPG, according to the car’s computer. My back-of-the-envelope math came up slightly lower at our last fill-up, but close enough. The climate control system lost it’s mind somewhere in Kentucky and was alternately blowing cold and warm, regardless of actual setting, for the rest of the ride. Things got a bit warm and sweaty, but not the worst I’ve ever had. Pennsylvania doesn’t know how to manage traffic around construction, of which the was plenty, including some standstills well before rush hour. Neither does Connecticut, where we were hitting standstills at 9 pm. That shouldn’t happen on a Tuesday night. Sixteen hours of straight driving is very, very tiring.